LG's OLED W8 wallpaper TV is the company's flagship TV for 2018. The 4K TV (which comes in either 65" or 77") is extremely thin (2.57 mm all the way) and attaches to the wall using magnets - with a thin cable that connects to the sound bar and interface box. The OLEDW8 is powered by LG's new a9 "intelligent processor" that promises better color and fast smart TV (webOS) operations. The TV supports Google's Assistant for natural language control, Dolby Atmos, HDR and 4K HFR. The 65-inch model, the OLED65W8 is now shipping in the UK for £7,999 (note: affiliate link to Amazon) - or just over $10,000 USD. 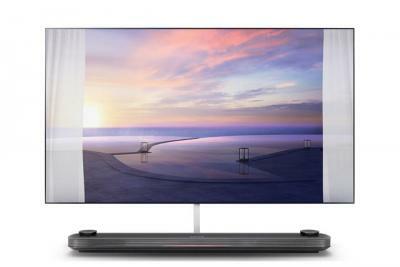 The 77-inch model (OLED77W8) costs around £9,999 in the UK (note: affiliate link to Amazon) and around €11,700 in Germany.